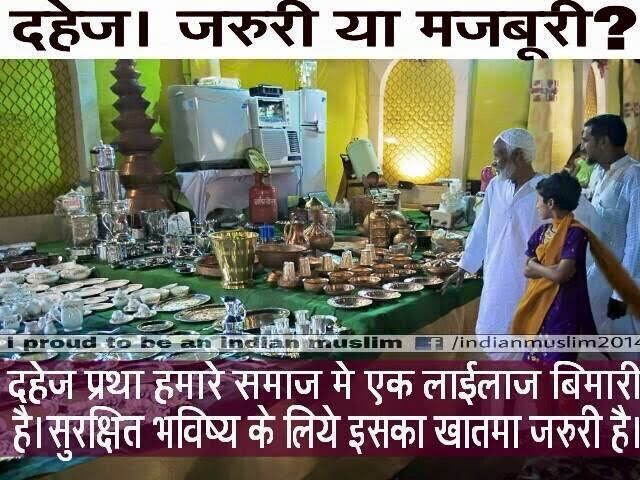 Although in Islam the concept of dowry is not found, dowry is a social evil rampant among Indian Muslims. On the contrary, Islam has a provision of mehr (dowager) to be given to the bride by the groom at the time of marriage. As mentioned in Surah Nisa: “And give the women their dowries with good heart.” The mehr is usually decided by the bride’s father based on the status of both the bride and the groom. Sadly many Muslims engage in a practice of dowry more often than in the practice of giving mehr. In simple words, dowry is a gift given by the parents to their daughter at the time of her wedding. It is supposed to be a token of love and blessing from the parents to the daughter. The Latin word, ‘dotare’, is root for the word ‘dowry’. Legally, dowry is defined as an amount of property or money brought by the bride during her marriage. Indian Muslims commonly use the Arabic term, ‘jahez’, for dowry. Muslims in India justify the practice of dowry by quoting the example of ‘jahez-e-Fatima’, the jahez given by the Prophet to his beloved daughter Fatima. According to a hadith, narrated by Hazrath Umme Salma, after the Prophet accepted a proposal from Hazrath Ali, the Prophet advised Ali to sell his war dress. Then he bought the following items as jahez for Bibi Fatima: two mattresses, a leather mat, pillows filled with palm-tree fibres, a pitcher, a pestle, and a hand mill. However, many forget that Bibi Fatima’s jahez consisted of basic things needed for daily life. The marriage was performed in a simple ceremony without any extravagance and pomp. According to another hadith, narrated by Salman Farsi, on the last day of Zilqad, the prophet invited the Muhajireen and Ansar for the marriage; after conducting the nikah and reading the sermon, the guests were fed a simple meal of lamb meat, bread, date fruit and milk. If the Prophet wanted, he would have conducted the wedding on a very grand scale. He refrained from doing so because he wanted to set an example for Muslims. Sadly today the scenario is very different. Families now demand dowry as if it is an obligation, which has to be fulfilled. The list of demands is long and never-ending: cash, gold, car, apartment; nothing is excluded from the list. How did this practice become part of a Muslim marriage? While many blame the Hindu tradition of dowry, the real problem lies with the Muslim nobility, especially during the Mughal Era. The noblemen married their daughters off with a huge dowry in the form of land, cash, and gold. In his book Dastan-i-Ghadar, Zahir Dehlavi describes the marriage of Mughal royalty, Darah Shikoh with his cousin, Nadira. Experts were invited to make brocades and jewelry from all parts of the kingdom; valuable gifts including semi-precious stone jewelry, gold ornaments and gold coins were given to the bride. Many other princesses received palaces and land as gift from their parents. The dowry usually included silver utensils, horses, and elephants. The same was expected when they got their sons married; girls who came with huge dowries were preferred by the nobles and rich families. While financial gain may not have been the aim, as political alliances and support were their main concern, the noble families encouraged exchange of huge amount of jahez. This political tool of the nobility soon became a social practice that spread to all sections of society. The Quran is explicit in its prohibition of dowry. Here is Surah Nisa, 34: “Men are the protectors and maintainers of women because Allah has given the one more than the other and because they support them from their means.” This verse puts the financial responsibility of marriage and maintenance of wives on men. Although many scholars have condemned the practice and even called it un-Islamic, the practice of dowry is still rampant. In 2014, clerics in Nalanda, Bihar, had declared that Muslim clerics would not conduct marriages of those who give or take dowry: “We have decided not to conduct nikah (marriage) for those who take and give Dowry.” Similarly, the Coimbatore Chapter of Tauhed Jamat in Tamil Nadu hosted an anti-dowry campaign and advised the youth against the practice of dowry. Surprisingly a community which listens to its scholars on most issues turns a deaf ear on the issue of dowry. Often the girl’s education and professional achievements are neglected during negotiations for a marriage. Many feel that since they can afford, there is nothing wrong in providing material gifts to their daughters. Others incur huge debt for paying dowry to their daughters. Ironically to repay these debts, they follow the same practice of dowry when they get their sons married. This results in a vicious cycle. Many girls remain unmarried as the families are unable to meet the dowry demands. In the worst cases, some girls continue to suffer even after marriage. They are harassed for not bringing the demanded dowry: either they are abandoned by their husbands or in some cases few are even burnt to death. Just to give one example. On Sep 10, 2006, the Times of India reported that a 23-year-old woman, Tasneem Khanum, married to Mohammad Zafar, was doused with kerosene and set ablaze for bringing a Maruti 800, instead of Maruti Cielo. The number of dowry death among Indian Muslims has increased drastically. According to a study in the Indian Journal of Gender Studies, it was around 4% in 1993 but in 2009 it increased to above 12%. Not to mention the increase in cases of dowry harassment, many of which are nor even reported. Among Muslims in India, dowry is most common in parts of Andhra, UP, Bihar, Tamil Nadu and Kerala; it is least common in Jammu & Kashmir and Maharashtra. Many campaigns are launched by the NGOs against the practice but they seldom achieve the results aimed. Many youngsters are against the practice but fail to convince the elders in the family. Under pressure, they relent and continue following the evil practice. Despite the fear of law, the number of dowry deaths has increased and harassment still continues. Not many families are keen on lodging a complaint on dowry demands or harassment. Very few brave families stand up against this evil. And to achieve better results at the grassroots level, awareness must be created. The clergy and scholars can play an important role and they should strongly condemn the practice and refuse to solemnize marriages where dowry is involved. Fight against the practice of dowry is not an easy task as in most cases one is fighting against their near and dear ones. To complicate matters, to continue this fight, one would have to fight against a system, which justifies the practice in the name of culture and tradition. Such fights are the toughest but have to be fought to save the future of our girls. We need to mobilize the youth and women to stop this practice. Read the latest issues of Cafe Dissensus Magazine on ‘Personal Journeys Toward Publication’, edited by Lisa D. Ellis, Author, Boston, USA. It was good as article was full of precise material which makes everyone to understand it easily and also highlighted the main issues behind taking Dowry , led by Mughals but we Muslims of today took it wronly ,now it has taken shape of a great burden on the every girls family if they are not able to meet the situation their girls are , no doubt , remain to live without the marriage … .. We must make aware of people that Dowry has no any place in Quran but it got its origin from Mughals rather Quran is against such great evils..